Depletion of B cells attenuates plaque development and modulates T cell responses in mouse models of atherosclerosis, suggesting that Ag presentation by B cells may promote disease progression. Thus, we set out to determine the role of B cell–mediated MHC class II (MHC II) Ag presentation during atherosclerotic plaque development. We developed murine conditional MHC II deletion and expression systems under control of the B cell–restricted CD19 promoter in an experimental model of atherosclerosis. Mice lacking MHC II expression only on B cells exhibited systemic shifts in germinal center and marginal zone B cell populations, leading to a reduced Ab response compared with littermate control animals. However, all populations were present and normal cholesterol uptake was detected in the plasma following high-fat diet treatment. In a second model, in which conditional expression of MHC II is limited only to B cells, showed similar overall cellularity characteristics compared with mice with complete MHC II deficiency. High-fat diet feeding showed no major changes in atherosclerotic plaque size or plaque cellular content in either conditional deletion or conditional expression approaches, compared with control animals. By testing the necessity and sufficiency of MHC II on B cells in the progression of atherosclerosis, we determine that MHC II on B cells does not directly regulate lesion development in murine models. Atherosclerotic plaques are driven by a subintimal influx of (potentially modified) cholesterol particles that are subsequently taken up by local phagocytes, leading to the formation of foamy cells that constitute the majority of total plaque cells. Of hematopoietic cells present, plaques predominantly consist of innate immune cells, which are the first cells to be detected and most numerous, particularly the monocyte and macrophage-lineage cells (1, 2). However, despite modest cell numbers in the lesion, the role of the adaptive immune system in disease progression has become increasingly recognized (3). B cell deficiency was tested in bone marrow (BM) transplant models of atherosclerosis, showing accelerated lesion development (4). However, B cell depletion using anti-CD20 Ab showed the opposite results, suggesting a protective function for B cells in atherosclerosis progression (5). These seemingly opposing results are reconciled when anti-CD20 Ab depletion was suggested to selectively remove atherosclerosis-promoting B2 B cells and have incomplete depletion of protective IgM-producing B cell subsets. The observed B cell–dependent shift in disease kinetics has typically been attributed to the Ab-producing function of B cells, where IgG-producing cells are generally considered proinflammatory and IgM-producing cells regarded as atherosclerosis-protective (3, 6, 7). Recent reviews have highlighted the differential roles of Ab production and have expanded on the potential contributions of individual B cell subsets to atherosclerosis (8–11). Importantly, specific depletion of the B2 subset of B cells, using the BAFF-R–deficient mouse, in atherosclerotic models results in a systemic reduction in CD4+ T cell activation (12). This phenotype was observed even in the presence of normal dendritic cell (DC) activation and profiling, suggesting that changes in T cell activation during atherosclerosis are a direct effect of B2 cell deficiency. These results may suggest that one potential mechanism of B2 cells is to promote T cell activation through Ag presentation. Therefore, we sought to address whether B cells mediate MHC class II (MHC II) might regulate plaque development in models of atherosclerosis. Identifying the cells responsible for Ag presentation to CD4+ T cells, and determining the locations where cognate interactions occur, has been a major interest to the cardiovascular field. Yet few studies have successfully assessed individual cell subset contributions in models of atherosclerosis. Sage et al. (13) found plasmacytoid DCs, a rare lymphoid-derived DC subset, are necessary for the promotion of atherosclerotic plaques following an 8-wk high-fat diet (HFD) regiment. Subsequent studies have suggested plasmacytoid DCs may have specific protective functions in eliciting the T regulatory cell response (14). However, further analysis will be needed to reconcile these conflicting results. Using a mixed BM chimera approach into Ldlr−/− recipient mice, a recent study suggested that MHC II expression by B cells was necessary for development of atherosclerosis (15). Surprisingly, other cell types typically considered professional APC subsets, such as conventional DC and macrophage have not been individually assessed for their contributions to Ag presentation in atherosclerosis. It is established that B cells can use the BCR to recognize native or modified Ags, allowing for processing and presentation to T cells (16). Ags like oxidized low-density lipoprotein (oxLDL) have been demonstrated as targets of Abs produced by B cells. Additionally, B cells were found to even endocytose and present transferred Ag on MHC II in regions that are relevant to disease progression (17). B cell–mediated Ag presentation is functionally relevant in models of autoimmunity in mice (18–20). Specifically, marginal zone (MZ) B cells, but not the more common follicular B cell, has been found to be potentially important players in Ag presentation (21). Thus, it is quite plausible that B cells may indeed play pivotal roles in promoting the adaptive T cell response in the pathogenesis of atherosclerosis. Using conditional deletion or expression systems in vivo, we address in this study whether Ag presentation by B cells on MHC II is a primary mechanism in the promotion of atherosclerosis. Interestingly, Ldlr−/− mice in which MHC II is specifically deleted on B cells showed no significant changes in plaque development following HFD feeding. Furthermore, the expression of MHC II on B cells alone was not sufficient to promote plaque growth compared with control MHC II–deficient mice when on the Ldlr−/− background. Together, these data argue that B cells are not instrumental in promoting atherosclerotic pathology through MHC II–mediated presentation. Mice were housed in specific pathogen-free animal facilities, maintained by Washington University School of Medicine. Six-week-old animals were used for all experiments and either given HFD for 8 or 20 wk or received a donor thymus with 8 wk recovery with subsequent HFD treatment for 8 wk. Strains CD19cre [no. 006785, B6.129P2(C)-Cd19tm1(cre)Cgn/J; Jackson Laboratory], MHC IIfl/fl, IAβbstopf/f, and Ldlr−/−(no. 002207, B6.129S7-Ldlrtm1Her/J; Jackson Laboratory) mice were housed and maintained at Washington University School of Medicine. HFD (Envigo Teklad TD.88137) containing 21% milk fat and 0.15% cholesterol was used for atherosclerosis studies. All experimental procedures were approved by the Washington University School of Medicine Institutional Animal Care and Use Committee. Blood samples were collected from the superficial temporal vein. Spleens were mechanically separated and digested in 1 mg/ml Collagenase II for 45 min at 37°C. For both blood and spleen samples, RBCs were lysed (Pharm Lyse, BD Biosciences) prior to counting (Cellometer X4, Nexcelom Bioscience) and processed for flow cytometeric staining. Samples were FcR-blocked (2.4G2; BioLegend), then stained on ice with specific Abs; CD45 Pacific Blue conjugated (30-Fl1; BioLegend), CD19 PE conjugated (eBio1D3; eBioscience), B220 PE conjugated (RA3-6B2; eBioscience), MHC II allophycocyanin/Cy7 conjugated (I-A/I-E) (M5/114; eBioscience), GL7 allophycocyanin conjugated (GL7; BioLegend), CD4 allophycocyanin conjugated (CK1.5; eBioscience), CD8α PerCP conjugated (53-6.7; BD Pharmingen), CD23 Fitc conjugated (B3B4; BioLegend), CD21 PEcy7 conjugated (7E9; BioLegend), TCRβ Fitc conjugated (H57-597; eBioscience), PD1 PE conjugated (29F.1A12; BioLegend), CXCR5 PerCPcy5.5 conjugated (L138D7; BioLegend), CD44 allophycocyanin/Cy7 conjugated (IM7; BioLegend), and CD62L PEcy7 conjugated (MEL-14; BD Biosciences). Samples were run on BD LSRFortessa instrument and analyzed using FlowJo 10 (Tree Star). B cell subsets were identified as follicular (CD19+ CD21− CD23+), MZ (CD19+ CD21+ CD23−), or germinal center (GC) (CD19+ GL7+). Hearts were collected and immediately fixed in 4% paraformaldehyde containing 30% sucrose. Hearts were then embedded in OCT (no. 4583; Tissue-Tek), and cryosections (10 μm) were prepared through the aortic sinus. Samples were stained with Oil Red O (ORO; no. 01516; Sigma-Aldrich) to determine lipid deposition. For sinus immunostaining for macrophage and smooth muscle area, sections were blocked with 5% donkey serum and stained with rat anti-MOMA2 (MOMA-2; Bio-Rad) and mouse anti-SMA (1A4; Thermo Fisher Scientific). Sections were washed and incubated with secondary Abs conjugated to Cy3 (catalog no. 712-165-153; Jackson ImmunoResearch) or Cy2 (catalog no. 715-545-150; Jackson ImmunoResearch) raised in donkey against the appropriate species. Sections were images on a Leica SPE microscope. Plaque area and content were measured using Image J analysis software. For en face analysis, aortae were fixed with 4% paraformaldehyde, adipose tissue was carefully removed, and the arteries were pinned onto wax dishes. Aortae were pretreated with 100% propylene glycol (no. P4347; Sigma-Aldrich) for 15 min, then incubated with ORO (no. 01516; Sigma-Aldrich) for 3 h at room temperature. Aortae were washed with 85% propylene glycol and then washed multiple times in PBS. Aortae were imaged on a Zeiss dissecting microscope, and plaque area measurements were made using Image J analysis software. For total Ig titers, plasma levels were measured using Southern Biotech Mouse Ig Panel (catalog no. 5300-01B), following manufacturers instruction. For Ag-specific oxLDL ELISA, plates (Nunc MaxiSorp) were coated with anti-oxLDL Ab (no. AB3230; MilliporeSigma) 1:250 in carbonate buffer at room temp for 3 h, then washed with TBST. Plates were then incubated with copper-oxidized human low-density lipoprotein (no. L34357; Invitrogen) diluted 1:100 in PBS for 2 h at room temp, then blocked with 0.5% BSA and washed with TBST. Plasma samples were loaded at 1:10 and 1:100 dilutions into wells and incubated overnight at 4°C, then washed three times with TBST. Detection Ab (Alkaline phosphatase–conjugated anti-IgG1 or anti-IgM; SouthernBiotech) was incubated at room temp for 1 h, then washed with TBST and finally rinsed in TBS. Substrate was added (catalog no. 5300-04B; SouthernBiotech) and incubated at 37°C for ∼30 min and read at 405 nm on a Cytation 5 plate reader. Mouse plasma was collected from whole blood with 5 mmol/L EDTA to reduce blood clotting, then stored at −80°C. Total plasma cholesterol levels were measured using Dako Cholesterol-E kit (439-17501) following the manufacturer’s instructions. The statistical significance of differences in mean values was analyzed by unpaired two-tailed Student t test, using Prism software. The p values <0.05 were considered statistically significant. Error bars show the SEM. B cell–mediated Ag uptake and presentation is a potential mechanism for the initiation of adaptive T cell responses in atherosclerosis. To test this hypothesis, we developed a conditional deletion system by crossing the CD19cre/+MHC IIf/f mouse (18) to an atherosclerotic mouse model on the Ldlr−/− background. Efficient and constitutive MHC II deletion was detected by flow cytometry of splenic B cells (Fig. 1A). Importantly, other CD19-negative APCs, including DCs and macrophages, maintained normal levels of MHC II expression (Fig. 1A, Supplemental Fig. 1A, 1B) (18). The spleens of CD19cre/+ MHC IIf/f Ldlr−/− or control (MHC IIf/f Ldlr−/−) mice on an HFD were examined for their ability to generate B cell populations. Although the total B cell pool and follicular B cells were normal in number, GC B cells (CD19+ GL7+) and MZ B cells (CD19+ CD21+ CD23+) were reduced when MHC II was deleted on B cells (Fig. 1B). CD19 has been previously established as a regulator of MZ B cell development (22), consistent with our finding that partial deletion of CD19 led to a 50% reduction in MZ cells numbers (Fig. 1B). Total ablation of MZ B cells was previously associated with loss of T follicular helper (Tfh) cells (23). However, we observed no shift in Tfh cells when MZ cells were only partially depleted (Supplemental Fig. 1C). Although MZ and GC B cells were reduced, those remaining in the spleen were localized in typical, anticipated architecture. Conditional deletion of MHC II on B cells does not regulate atherosclerotic plaque development in Ldlr−/− mice. (A) Spleens from naive CD19cre/+MHC IIf/f Ldlr−/− or littermate control mice were assayed for B cell expression of MHC II by flow cytometry. (B) Spleen B cell subsets were identified in the spleens of chow fed CD19cre/+MHC IIf/f Ldlr−/− mice to assess cellularity changes. Following 8 or 20 wk of HFD feeding, CD19cre/+MHC IIf/f Ldlr−/− mice were assessed for plaque development in the aortic sinus (scale bar, 250 μm) (C) and aortic arch (original magnification ×10) (D) by ORO staining. (E) Total plaque area and percentage of plaque staining area was quantified. (F) Representative image of an aortic sinus from 8 wk HFD-fed wild-type mouse stained for macrophage (MOMA2) and smooth muscle cell content (smooth muscle actin; SMA). Scale bar, 100 μm. (G) Percentage of macrophage and SMA content was quantified. (A) Representative or (B) combined data from two independent experiments containing three to five mice per group. (C–E and G) Data are representative of two or three independent experiments containing five to nine animals per group each. *p ≤ 0.05, **p ≤ 0.01, by nonparametric Student t test. To test the role of MHC II on B cells in atherosclerosis progression, CD19cre/+MHC IIf/f Ldlr−/− or control (MHC IIf/f Ldlr−/−) mice were fed a cholesterol-rich HFD for 8 or 20 wk. The aortic root and aortic arch are the primary and best studied sites where plaques form in mice; therefore, we assessed plaque development in these locations by ORO staining to identify areas of neutral lipid deposition (Fig. 1C, 1D). Conditional deletion of MHC II on B cells showed no significant changes in plaque size at either time point analyzed when compared with their littermate controls (Fig. 1E), suggesting that B cells are not essential players in MHC II–dependent Ag presentation during atherosclerosis. This conclusion was further supported by the observation that there were no changes in CD4 T cell activation markers observed in the aorta-draining mediastinal lymph nodes (Fig. 2D). Cellular compositions of plaques at 8 wk of HFD feeding, including foamy macrophages and smooth muscle cells, were also similar between experimental groups (Fig. 1F, 1G). MHC II expression on B cells is required for oxLDL-specific Ab responses in atherosclerosis. Conditional deletion of B Cell MHC II in a model of atherosclerosis. (A) Total cholesterol levels in plasma of CD19cre/+ MHC IIf/f Ldlr−/− or control mice, following 0, 4, or 8 wk HFD feeding. (B) Total serum Ab titers were measured by specific ELISA (isotype as indicated) in control (MHC IIf/f Ldlr−/−) or CD19cre/+ MHC IIf/f Ldlr−/− mice following 8 wk of HFD feeding. (C) oxLDL-specific IgM and IgG1 levels in the serum of CD19cre/+ MHC IIf/f Ldlr−/− mice following 8 wk of HFD feeding. (D) Mediastinal lymph node CD4 T cells were analyzed for expression of activation markers CD44 and CD62L following 8 wk HFD feeding. (A–D) Data shown are n ≥ 5, repeated in two independent experiments. *p ≤ 0.05, **p ≤ 0.01, by nonparametric Student t test. Importantly, and consistent with plaque measurements, serum cholesterol levels were unaffected at 4 or 8 wk of HFD treatment between CD19cre/+MHC IIf/f Ldlr−/− or control (MHC IIf/f Ldlr−/−) mice (Fig. 2A). By modulating MHC II expression on B cells, it was expected there would be defects in the development of IgG and potentially reduced Ag-specific responses (20). We observed reduced levels of total IgG1 and IgG2c in the serum of CD19cre/+MHC IIf/f Ldlr−/− mice compared with controls following HFD feeding (Fig. 2B), whereas these mice showed similar titers for IgM and IgG2b. CD19cre/+MHC IIf/f Ldlr−/− mice were also found to have reductions in atherosclerosis-relevant anti-oxLDL–specific Ag responses in IgM and IgG1 isotypes in the serum (Fig. 2C). These data confirm that deletion of MHC II on B cells leads to attenuation of Ab responses in atherosclerosis. However, they also support a conclusion in which class-switch associated with the development of oxLDL-specific IgG1 responses is not a regulator of lesion development when IgM affinity maturation to relevant Ags is likewise reduced. Because other APCs (such as DC or macrophage) or B cells not efficiently deleting MHC II in our conditional deletion model may be able to compensate for the loss of MHC II expression on the majority of B cells, we next sought to determine whether B cell subsets were able to drive atherosclerosis as independently as APCs when all other cells were deficient for expression. To conditionally express MHC II on only B cells in atherosclerosis, we bred the CD19cre/+ IAβbstopf/f mouse (19) to the Ldlr−/− background. Effective conditional expression of MHC II was observed only on CD19+ cells when spleens were assessed by flow cytometry (Fig. 3A). Expression levels of MHC II on the surface of B cells were at levels comparable to those of control B cells (Fig. 3B). As expected, because of a lack of MHC II–mediated selection in the thymus, both control cre-negative CD19+/+IAβbstopf/f Ldlr−/− mice (completely MHC II deficient) and conditional expressing mice CD19cre/+ IAβbstopf/f Ldlr−/− (only B cells expressing MHC II) were largely devoid of circulating CD4+ T cells (Fig. 3C, 3D). To study animals with a competent CD4+ T cell population, we performed thymic transplants. In this approach, young Ldlr−/− pup thymi were transplanted into the axillary region of recipient mice and given 8 wk to reconstitute a T cell compartment in the transplant host (24). Following 8 wk, CD4+ T cell populations were expanded 10-fold in the peripheral blood (Fig. 3C, 3E) and spleen (Supplemental Fig. 2A) compared with nontransplanted controls, albeit at levels below that of MHC II–sufficient Ldlr−/− mice. B cell populations in these animals were largely found to be in normal numbers and proportions. However, GC and MZ B cells were partially reduced in CD19cre/+ mice similar to our conditional deletion model (Supplemental Fig. 2B), likely because of heterozygosity of CD19 (22). Conditional expression of MHC II on B cells does not regulation atherosclerotic plaque development in Ldlr−/− mice. (A) Spleens from Ldlr−/−, IAβbstopf/f Ldlr−/−, and CD19cre/+ IAβbstopf/f Ldlr−/− mice were assayed for B cell expression of MHC II. (B) Histogram of MHC II expression levels in CD19+ spleen cells from indicated strains. 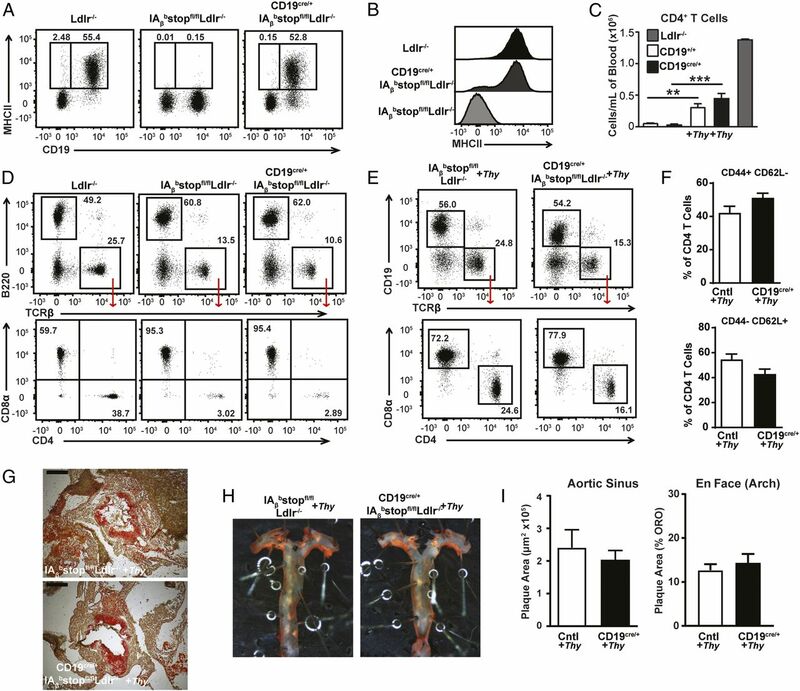 (C) CD4+ T cell counts for the blood of IAβbstopf/f Ldlr−/−and CD19cre/+ IAβbstopf/f Ldlr−/−mice before or after thymic transplantation, compared with control Ldlr−/− mouse. Representative flow plots showing T cell populations (D) before or (E) following thymic transplantation and 8 wk recovery of IAβbstopf/f Ldlr−/− and CD19cre/+ IAβbstopf/f Ldlr−/−, and compared against control Ldlr−/− mice. Following thymic transplantation, 8 wk reconstitution, and 8 wk HFD feeding, mice were assayed for CD4 T cell activation in the mediastinal lymph node (F), as well as staining for plaque deposition in the aortic sinus (scale bar, 250 μm) (G) and aortic arch (original magnification ×10) (H), quantified in (I). Scale bar, 250 μm. (A)–(F) are representative or combined data from two independent experiments containing three to five mice per group. (F)–(H) contain five to six animals per group and are representative of three independent experiments. **p ≤ 0.01, ***p ≤ 0.001, by nonparametric Student t test. To determine whether expression of MHC II on B cells is sufficient to promote atherosclerosis progression we directly compared IAβbstopf/f Ldlr−/− with CD19cre/+ IAβbstopf/f Ldlr−/− mice following thymic transplantation and an additional 8 wk HFD feeding regimen. Both strains of mice showed similarly elevated cholesterol levels following HFD treatment (Supplemental Fig. 2C) and no significant changes in CD4 T cell activation in the aorta-draining mediastinal lymph nodes (Fig. 3F). Subsequent plaque analysis in the aortic sinus and aortic arch found that complete MHC II–deficient (control) or conditional expressing CD19cre/+ IAβbstopf/f Ldlr−/− mice showed no significant differences in plaque development as measured by ORO staining (Fig. 3G–I) or cellularity (Supplemental Fig. 2D), indicating that exclusive expression of MHC II by B cells alone does not enhance atherosclerosis. Mice were also observed to have similar levels of serum Ab responses following HFD feeding (Supplemental Fig. 2E, 2F). Together, these data show that MHC II–mediated Ag presentation by B cells is neither necessary nor sufficient for atherosclerotic disease progression. Despite adaptive immunity being implicated in murine models of atherosclerotic disease since the early 1990s, little is understood in terms of where Ag presentation occurs or which cells are responsible for cognate interactions with T cells. Targeting the adaptive immune system for therapeutic intervention of high-risk patients has been gaining momentum and may be more feasible than broadly targeting the innate immune system (25). The role of MHC II on B cells was previously investigated using a mixed BM chimera approach. Specifically, (80%) B cell–deficient BM (μMT) was mixed with (20%) MHC II−/− BM and transferred into irradiated Ldlr−/− mice, creating a system in which all donor B cells were MHC II−/−, and the majority of other cells would presumably derive from 80% MHC II–sufficient precursors. In contrast to our findings, this approach reported a remarkable reduction in overall plaque size and no change in the plaque content (15). In agreement, IgG against oxLDL (our study) or total IgG was dramatically suppressed (15). However, they also observed a reduction in activated CD4 T cells systemically, which may be a confounding factor when interpreting the results. That is, it remains controversial whether loss of MHC II on B cells with DCs fully sufficient in MHC II would markedly alter T cell activation systemically, even if effects on immunity to particular Ags does require MHC II on B cells (15, 19, 20, 26–29). Both of our loss- and gain-of-function approaches in our study showed control levels of CD4 T cell activation in draining lymph node and spleen (data not shown). Possible explanations for the divergent results may relate to the impact of radiation on atherosclerosis (30) or that the BM chimera left the DC compartment with a substantial proportion of DCs also lacking MHC II. Indeed, data provided in the study seems to suggest the presence of more CD11c+ cells lacking MHC II than observed in control mice (15), although no formal analysis of this issue was reported. However, we cannot eliminate the possibility that our study failed to delete MHC II as fully as Tay et al. (15). Nonetheless, we underscore our additional finding that MHC II expressed only in B cells did not drive plaque progression. Our findings may rule out a role for B cells in Ag presentation in driving atherosclerosis, but they do not imply that B cells are not key mediators in atherosclerosis. First, Ag presentation is not necessary for innate Ab production and thus the well-established atherosclerosis-protective role for innate Abs in atherosclerosis is not addressed by our studies. However, based on serum Ab titers for IgG1 and Ag-specific Ab responses (Fig. 2, Supplemental Fig. 2), our data suggest that modulation of IgG1 levels alone is not sufficient to modify atherosclerotic plaque outcomes. This result is at odds with some results published previously suggesting that in the absence of IgG1, responses against relevant atherosclerosis Ags like oxLDL would lead to a reduction in overall disease burden (5, 7, 9, 31). Moreover, in our system, IgM-specific oxLDL responses were also attenuated, which may point to an important regulatory balance between IgM and IgG titers. B cells likely play additional roles outside of the traditional Ab-producing functions studied to date. A recent study has shown that loss of the MZ B cell population regulated atherosclerosis progression (23). Interestingly, in our model we find that having a partial loss of the MZ B cell pool was sufficient to reverse the protection identified in MZ-deficient models and showed no change in the Tfh pools of cells. Additionally, recruitment of B cells to artery-associated tertiary lymphoid organs (ATLOs) remains to be fully understood in diversity and function (32), and were previously argued to house B cells capable of picking up transferred Ags in vivo (17). In our models, we tested the role of Ag presentation in animals that are largely devoid of ATLO structures, as such structures only form late in disease. Thus, it remains possible that B cell Ag presentation may play an important role in later disease states involving ATLO structures. Furthermore, the roles of B cells in more complex lesions from later diseased states or even at peripheral sites where plaques are known to form were also not assessed in our study. In conclusion, we addressed the hypothesis that B cells could be important players in T cell activation through MHC II–mediated presentation to CD4 T cells. However, using sophisticated conditional deletion and expression systems in vivo, we find that B cell expression of MHC II is neither necessary nor sufficient for atherosclerosis, indicating that roles for B cells in disease are not due to traditional cognate interactions with T cells. We thank the Washington University Flow Cytometry Core Facility for technical assistance in experiments and members of the Randolph Laboratory for help in preparation of this manuscript. This work was supported by National Institutes of Health (NIH) R01 HL118206, R37 AI049653, and DP1DK109668 (to G.J.R.). J.W.W. was supported by NIH Training Grant 2T32DK007120-41, American Heart Association Grant 17POST33410473, and NIH K99 HL138163. A.E. was supported by NIH Training Grant T32-HL07081-38. G.F.W. was supported by Grant R01NS083678 from the National Institute of Neurological Disorders and Stroke. 2014. Mechanisms that regulate macrophage burden in atherosclerosis. Circ. Res. 114: 1757–1771.
. 2018. Macrophage biology, classification, and phenotype in cardiovascular disease: JACC macrophage in CVD series (Part 1). J. Am. Coll. Cardiol. 72: 2166–2180.
. 2018. The role of B cells in atherosclerosis. Nat. Rev. Cardiol.
. 2002. B-lymphocyte deficiency increases atherosclerosis in LDL receptor-null mice. Arterioscler. Thromb. Vasc. Biol. 22: 1892–1898.
. 2010. B cell depletion reduces the development of atherosclerosis in mice. J. Exp. Med. 207: 1579–1587.
. 2015. B-1b cells secrete atheroprotective IgM and attenuate atherosclerosis. Circ. Res. 117: e28–e39.
. 2010. Conventional B2 B cell depletion ameliorates whereas its adoptive transfer aggravates atherosclerosis. J. Immunol. 185: 4410–4419.
. 2014. Multiple potential roles for B cells in atherosclerosis. Ann. Med. 46: 297–303.
. 2014. B cells and humoral immunity in atherosclerosis. Circ. Res. 114: 1743–1756.
. 2012. B cell subsets in atherosclerosis. Front. Immunol. 3: 373.
. 2017. Plan B (-cell) in atherosclerosis. Eur. J. Pharmacol. 816: 76–81.
. 2012. BAFF receptor deficiency reduces the development of atherosclerosis in mice–brief report. Arterioscler. Thromb. Vasc. Biol. 32: 1573–1576.
. 2014. MHC Class II-restricted antigen presentation by plasmacytoid dendritic cells drives proatherogenic T cell immunity. Circulation 130: 1363–1373.
. 2016. Indoleamine 2,3-dioxygenase-expressing aortic plasmacytoid dendritic cells protect against atherosclerosis by induction of regulatory T cells. [Published erratum appears in 2016 Cell Metab. 24: 886.] Cell Metab. 23: 852–866.
. 2018. 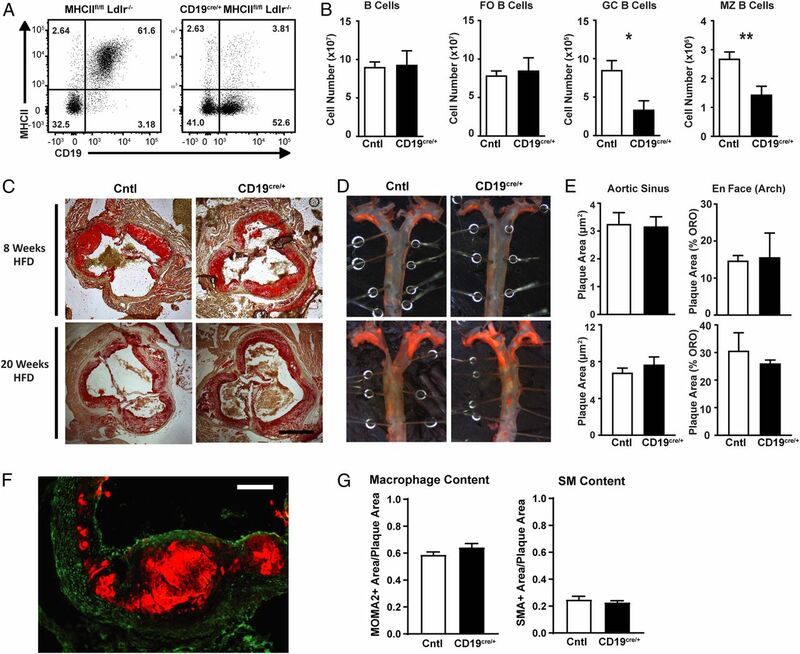 Follicular B cells promote atherosclerosis via T cell-mediated differentiation into plasma cells and secreting pathogenic immunoglobulin G. Arterioscler. Thromb. Vasc. Biol. 38: e71–e84.
. 2013. How B cells capture, process and present antigens: a crucial role for cell polarity. Nat. Rev. Immunol. 13: 475–486.
. 2015. Artery tertiary lymphoid organs control aorta immunity and protect against atherosclerosis via vascular smooth muscle cell lymphotoxin β receptors. Immunity 42: 1100–1115.
. 2015. B cell antigen presentation is sufficient to drive neuroinflammation in an animal model of multiple sclerosis. J. Immunol. 194: 5077–5084.
. 2013. Cutting edge: Conditional MHC class II expression reveals a limited role for B cell antigen presentation in primary and secondary CD4 T cell responses. J. Immunol. 191: 545–550.
. 2015. B cell-specific MHC class II deletion reveals multiple nonredundant roles for B cell antigen presentation in murine lupus. J. Immunol. 195: 2571–2579.
. 2000. Positive selection from newly formed to marginal zone B cells depends on the rate of clonal production, CD19, and btk. Immunity 12: 39–49.
. 2017. Marginal zone B cells control the response of follicular helper T cells to a high-cholesterol diet. Nat. Med. 23: 601–610.
. 2011. Limited sufficiency of antigen presentation by dendritic cells in models of central nervous system autoimmunity. J. Autoimmun. 36: 56–64.
. 2017. Readapting the adaptive immune response - therapeutic strategies for atherosclerosis. Br. J. Pharmacol. 174: 3926–3939.
. 2014. B cell antigen presentation in the initiation of follicular helper T cell and germinal center differentiation. J. Immunol. 192: 3607–3617.
. 2005. Concerted antigen presentation by dendritic cells and B cells is necessary for optimal CD4 T-cell immunity in vivo. Immunology 115: 556–564.
. 2008. The role of B lymphocytes as antigen-presenting cells. Arch. Immunol. Ther. Exp. (Warsz.) 56: 77–83.
. 1998. B lymphocytes are critical antigen-presenting cells for the initiation of T cell-mediated autoimmune diabetes in nonobese diabetic mice. J. Immunol. 161: 3912–3918.
. 2018. Irradiation abolishes smooth muscle investment into vascular lesions in specific vascular beds. JCI Insight DOI: 10.1172/jci.insight.121017.
. 2013. BAFF receptor mAb treatment ameliorates development and progression of atherosclerosis in hyperlipidemic ApoE(-/-) mice. PLoS One 8: e60430.
. 2016. Artery tertiary lymphoid organs control multilayered territorialized atherosclerosis B-cell responses in aged ApoE-/- mice. Arterioscler. Thromb. Vasc. Biol. 36: 1174–1185.